Officer Jason Van Dyke was convicted of murder Friday after shooting a black teenager 16 times in October of 2014. 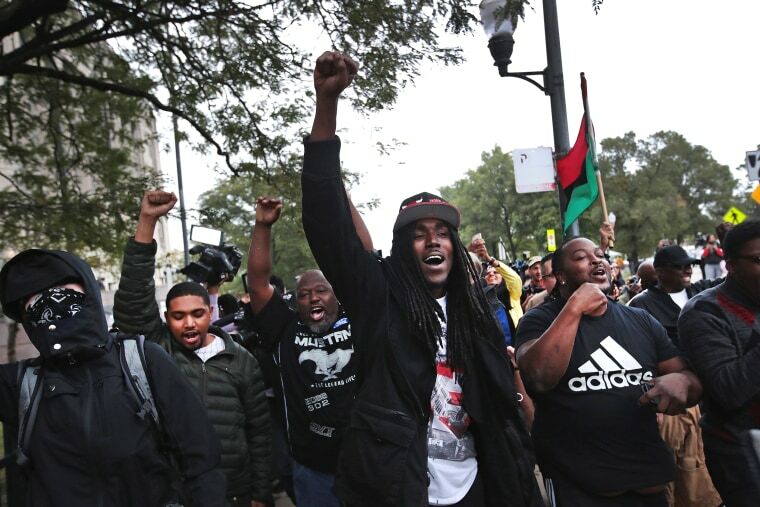 CHICAGO — Activists in Chicago used protests to celebrate the murder conviction of a white police officer who killed a black teenager in 2014. Officer Jason Van Dyke was found guilty of second-degree murder Friday afternoon for shooting 17-year-old Laquan McDonald 16 times on October 20, 2014. Van Dyke was responding to report of someone breaking into vehicles when he shot McDonald 16 times, before his call for backup was answered. Crowds cheered and hugged each other outside the courtroom after the verdict was read, less than 24 hours after the jury began deliberations. Special Prosecutor Joe McMahon called the verdict "gratifying." "We are all pleased that we have been successful in our pursuit for justice for Laquan McDonald, for his mother Tina, and for their family and friends," McMahon said in a press conference. "But a guilty verdict doesn't undo a crime. This verdict holds Jason Van Dyke accountable for his actions. It provides some justice for Laquan McDonald and Tina, for Laquan's family and friends. And it provides validation and a sense of justice for many residents in Cook County." Marvin Hunter, McDonald’s great uncle, said the verdict was the culmination of a "journey" that began four years ago. "When we began this journey, I called several African American lawyers and civil rights people and those people thought it was impossible to have a police officer convicted in the county of Cook in the city of Chicago for doing anything to a black person," he said. "However, I continued to believe we could get justice. I decided to dare believe beyond what was being said to me." Demonstrators began peacefully protesting in downtown Chicago's Loop area shortly after the verdict, chanting "Justice for Laquan, justice for all" and "The whole damn system is guilty as hell." The crowds marched in the streets holding signs in support of Black Lives Matter and Laquan McDonald. "This is just the first step, we have a long way for the black community to get truly get justice," protester Duke White, who said his cousin was also shot by police, told NBC News. "Police have always disrespected us." Jessica Rojas, an activist with Filipinos for Black Liberation, told NBC News she was out in the streets to show solidarity as a fellow minority that "we can never let this happen again." "The conviction of Jason Van Dyke is highly important and connected to the struggles of people all over the world," Rojas told NBC News. Activists also chanted "no cop academy," demanding money from the city's budget be transferred from law-enforcement projects to community-related ones. Police meanwhile maintained a presence around the protesters, holding a line as the crowds grew bigger and began spilling into traffic. At one point, demonstrators locked arms to shut down a busy intersection on Ontario Street and Michigan Ave on the Magnificent mile, saying "it is our duty to fight for each other." Joseph Williams, from the Englewood neighborhood on the southwest wide of the city, said he was in the courtroom Friday and believed justice was served. "This is going to be a new start for Chicago," Williams told NBC News. "This is one step in the right direction, To hear a conviction shows police accountability but this is just the start. This is the start of new policies, new leadership, new accountability." The rapper-turned-actor Common, who grew up in Chicago, tweeted a video that said, "Justice was served, but we can't celebrate yet." "Though the life of Laquan McDonald can’t be brought back, justice can be served and we can still do the work and fight the good fight in his spirit," Common captioned the clip. Chicago Mayor Rahm Emmanuel released a joint statement with Police Superintendent Eddie Johnson encouraging residents to "partner with each other" on the heels of the verdict. "This is the city we love," the statement read. "While the jury has heard the case and reached their conclusion, our collective work is not done. The effort to drive lasting reform and rebuild bonds of trust between residents and police must carry on with vigor."